If you're a User Authorized for multiple Franchise Contexts (Markets), you may notice that your usual selections seen in Inteliguide's Context Menu are sometimes missing in Patrolguide. That's because the Patrolguide Patrol Process is a finite state machine. That simply means you're locked into each step of the process unless there are specific outlets to abort the current Tour or the Patrol (marked clearly with ABORT buttons). To Patrol another Market, you must abort your current Patrol on the Choose Location screen and switch to a new Context through your Context Menu. 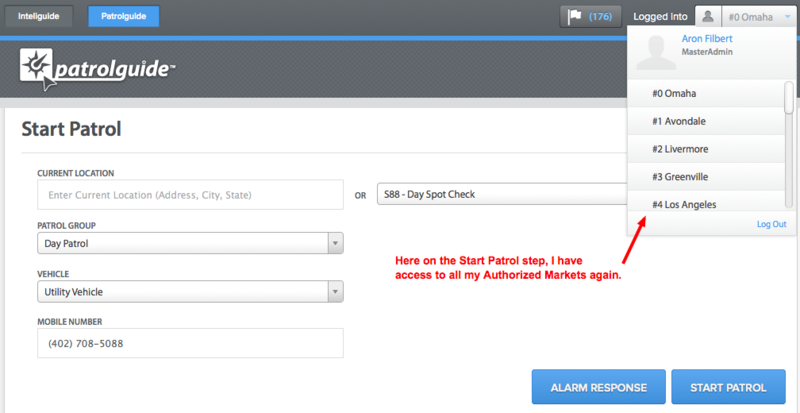 Drop it down, select the Market you want to Patrol, and complete the Start Patrol Form. You'll be good to go from there!